With every great challenge comes a great reward, right? We definitely didn’t feel that way the first time a BOSU was placed in front of us. In fact, we both thought our trainers had lost their mind and was putting us on what had to be a death trap. The BOSU has become one of our favorite pieces of gym equipment. It is easy to get a full-body strength and cardio workout using just the BOSU alone. We're here to answer what it is, how to use it and give you a full-body workout to try with just this one piece of equipment. BOSU stands for “both sides up,” which also describes the two ways it can be utilized. Doesn’t that already make it a little less intimidating? It is a two-sided piece of equipment that features a flat platform on one side, and a rubber dome on the opposite. The “ball” adds an element of instability to your workouts and forces you to use your core to stay steady. If you are looking to work on balance and stability, increase endurance, or spice up basic movements, the BOSU is for you. If you can already complete a set of push-ups, lunges, or squats, the BOSU could be a great addition to your training. The BOSU fits perfectly into one of our biggest mantras, “Shake things up!” It provides variety and many options to keep you challenged. It’s also a good option for people working at multiple levels. 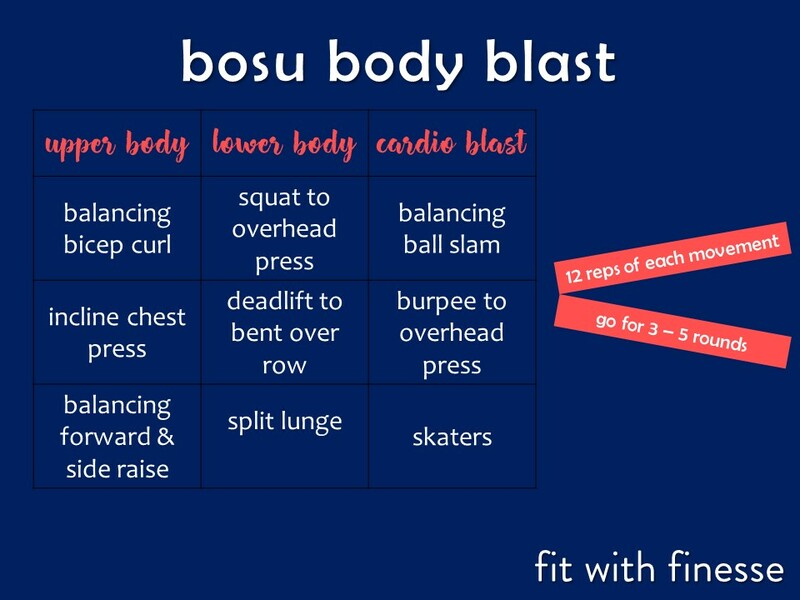 Give the full-body BOSU workout below a try. Make sure you come back to drop us a comment on how much you like it. #FinesseTip: Remember there is no need to take your training too fast. Start out using the BOSU on its flat side and work your way up to killer workout balancing on the dome.